I think every chapter should in some way ask a question relevant to the overall story and, in some way (blatantly or indirectly) answer it. That means, a problem set up in the beginning of the chapter should be solved by the end. Now, you can ask and answer (or not answer) loads of other questions throughout a chapter, but giving each chapter a central problem solved in some way before its conclusion will lend that section of the novel focus, momentum, and engagement for the reader. Think of The Unexpected Task, Chapter Twenty-Two in Harry Potter and the Goblet of Fire. The chapter opens with Professor McGonagall informing Harry that he’ll need a dance partner for the Triwizard Tournament’s ceremonial Yule Ball. This means that fourteen year old Harry is going to have to ask out a girl. Now, over the course of Chapter Twenty-Two, loads of other things happen that affect other plotlines important to the novel. Hagrid has been interviewed by Rita Skeeter, and Harry’s worried what she’ll say about his well-meaning but bumbling half-giant friend. Harry is avoiding having to deal with the riddle within his Golden Egg, the clue given to him at the end of the Triwizard Tournament’s First Task meant to prepare him for its Second. Fred and George are acting suspicious, writing letters to someone, but they won’t say who. Hermione’s unexpectedly furious that Ron is only interested in asking how the prettiest girl he can find (and Ron is in turn mortified when he, to his own surprise, attempts to ask out Fleur Delacour.) Harry finds out that his crush, Cho Chang, is going to the Ball with Cedric, his competition in the Tournament, and a mystery is set up as it’s revealed that Hermione has been asked by someone to the Ball–she won’t say who. In the course of this chapter, we’ve gotten several mysteries set up–What will Rita Skeeter write about Hagrid? Who is Fred and George writing to? And who asked Hermione to the Yule Ball? Story arcs are pushed along–the potentially romantic tension between Hermione and Ron, Harry’s crush on Cho, the stress and tension of the upcoming Second Task and Harry’s inability to figure out his clue, and Rita Skitter’s pervasive buzzing around the Hogwarts’ grounds. But, for all that’s going on, the chapter closes with an answer to the question, a solution to the problem, it initiated within its first two or three pages: Harry decides, on a bit of a desperate whim, to ask Pavarti Patil to the Ball. She agrees to go with him, thus the conflict threading together the events of the chapter comes to a satisfying conclusion. 2. The chapter should follow its own (truncated) version of the plot diagram. Trigger — Rising Action — Climax — Resolution. The four simple steps every writer should know by heart. It’s a good idea to have every chapter follow a miniature version of the plot diagram–the rising stakes will keep readers invested in the action, and a miniature climax and sense of conclusion will make the chapter feel polished and satisfying. Using The Unexpected Task as an example once again, we see an Inciting Incident (McGonagall reveals that Harry is going to have to find a dance partner for the Ball), rising action (conflict and complications as he tries and fails to secure a date), a climax (swallowing his disappointment over Cho and asking Pavarti), and a sense of resolution. (Pavarti agrees, and tells Harry that Ron, also partner-less, can take her sister.) In the final line, Harry hopes that Padma Patil’s nose is dead center, a humorous remark about Ron’s picky standards that brings the chapter to a satisfying close. Chapters that ramble on disjointedly with no internal focus dull the impact that individual scenes within the chapter might’ve otherwise enjoyed. You can fix that problem of meandering, stitched-together scenes by giving each chapter a sense of invested stakes, a complication, a climatic rise of the drama, and a satisfying resolution to the conflict. Just as you want the end of your book to mirror the beginning, consider setting up mirrors and parallels with each individual chapter. This goes hand in hand with Example 1–By answering at the close a question you asked in the opening, your chapter has a nice, bookended feeling. These mirrors and parallels give your moments a polish and focus that cannot be understated. 4. And So / But Then. Words every writer should live by. Good chapter are made up of scenes that lead sequentially and consequentially to each other. Employ the “And So / But Then” method to your plotting. This means, make sure every scene in your chapter can connect with the next with either an “And so…” or a “But then…” statement. A character’s actions should never exist in a vacuum. Every choice your character makes should have a consequence. Linking scenes together in meaningful, purposeful ways gives your chapter more focus, and makes the writing feel intentional and polished. 5. Every chapter should advance the story. In the end, this is the ONLY advice that truly matters. If your chapter can be cut out without any tweaking to the overall story, the chapter shouldn’t have been there to begin with. Every chapter should be DIRELY important to the structure of your novel– every chapter, every scene, should be one of those Jenga pieces that won’t even move when you push on it, because it’s bearing the brunt of the tower’s weight. Your chapter has to have interactions, revelations, questions, answers, mysteries, disasters, triumphs, and other vital moments without which your story would not make sense. If the chapter is expendable, then change it, make it matter. This, at the end of the day, is the most important thing about any chapter in your novel: it has to earn the right to be there. 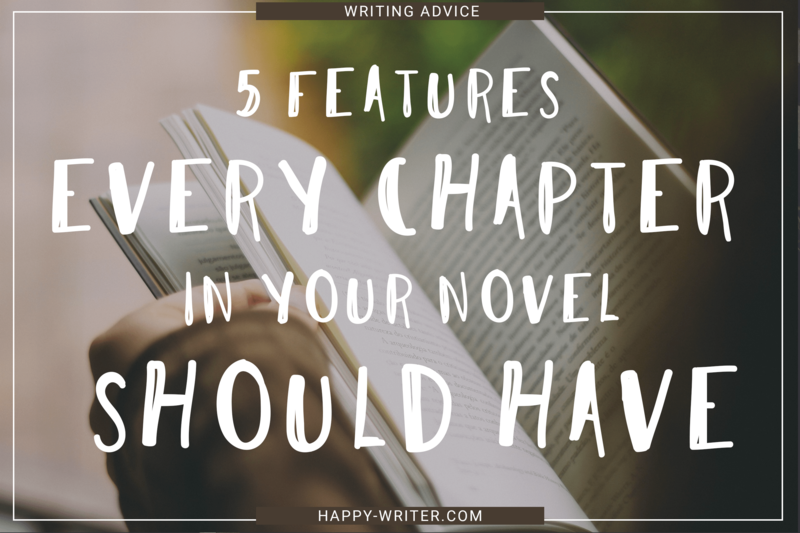 Do you have any other tips for writing big, beefy, succulent, devourable chapters? Leave a comment below, share your thoughts! !